So this is certainly worth a mention. One of dport7’s most frequent contributors “The Jew” has gone the extra dport7 mile. 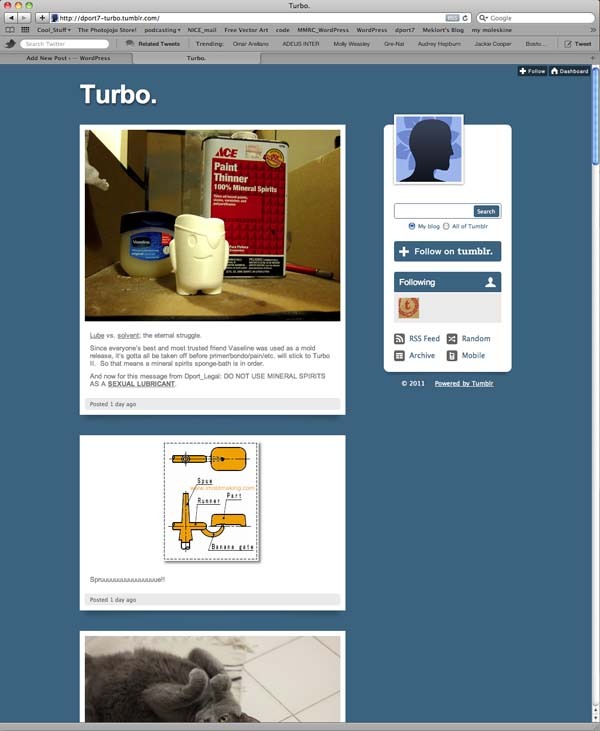 Jon asked me a month or so ago to send him the 3D print of Turbo because he was interested in trying to cast him. Begrudgingly I places turbo in the mail to D.C. and Jon started on a casting journey to bring a 3 dimensional Turbo into your home. In true internet fashion he started a tumblr blog to help document the process. A few weeks ago I did a simple tumblr embed of his site right here on dport7. You can see his most recent 10 entries by clicking on TURBO CASTING in the menu. You can see the entire site by clicking here. Check it out it’s going pretty well. On October 14, 2018 2:22 pm went 3.27 mi. during 00:27:28 hours climbing 130.91 ft.
On September 23, 2018 10:58 am went 0.60 mi. during 00:04:04 hours climbing 47.90 ft.
On September 23, 2018 10:53 am went 0.00 mi. during 00:02:46 hours climbing 0.00 ft.
On September 6, 2018 7:34 am went 0.03 mi. during 00:00:29 hours climbing 0.00 ft.
On September 6, 2018 6:40 am went 3.81 mi. during 00:28:05 hours climbing 182.74 ft.